Security AntiVirus Software Guide & Faqs - How to Anti Virus, Trojans, Worms, Spyware, Adware etc. Mac Cleanse Guide - Easily clean and remove recent file histories, chat logs, caches, cookies, web site histories, and more for mac users. Internet Tracks Washer Guide - Protect your privacy by cleaning up activity traces and tracks on your PC and the Internet. 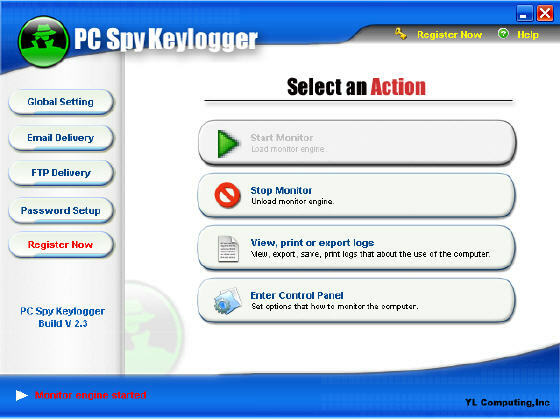 Perfect Keylogger Guide - Perfect Keylogger - Powerful and easy to use solution for PC and Internet surveillance! Spy Cleaner Gold Guide - It can scan spyware and adware automatically, and then clean them to protect your computer. SpyNoMore Guide - A leading Anti-Spyware software which can detect and eliminate intrusive pests such as trojans, spyware, adware, worms hacker tools and so on. Spy Noose Guide - It detects all the installed spywares, adwares, dialers, keyloggers, web bugs and other malwares present in your system and cleans them permanently. Power Spy 2007 Guide - Computer spy software / monitoring software, nvisible keylogger, email and messenger spy software, perfect for catching acquiring others' passwords, chat records and websites visited, and even investigating crimes. Adware Remover Guide -It easily detects and removes all forms of spyware and adware with a few clicks.Proven security that helps prevent adware. Anti Spyware - Spy Noose Guide - Protects your system with Spywares, Adwares, Trojans, Worms and prevents attack with its Active Protection Shields. Spyware Doctor Guide - Protect your PC through real-time threat blocking, advanced system scanning and immunization against known browser infections. SpyBlocs Guide - It could increase your Internet Speed by optimizing performance, even prevent sites from changing your home page and identify spyware and more. SpyFighter Cleaner Pro Guide - SpyFighter Cleaner Pro can help you detect and remove spyware and adware, and protect your PC security. SpyZooka Guide - A complete anti-spyware system prevents your PC from Spyware hijackers and keep safe. SpyCatcher Guide - SpyCatcher is a complete anti-spyware system. With this software you can prevent spyware and do anything you wish online. Desktop Armor Guide - Security holes! New viruses! Programs changing your computer at will! You need to protect yourself with -- Desktop Armor. East-Tec Eraser 2006 Guide - Protect your privacy, identity and secret information and remove all evidence of your computer and online activity. CyberScrub AntiVirus Lifetime Edition Guide - A reliable program to free your computer from attacks - CyberScrub AntiVirus, Lifetime Edition is designed to provide reliable anti-virus protection for home computers. History Sweeper Guide - History Sweeper effectively clean up the history of your activities on PC when you are on the Internet. Tracks East-Tec Eraser 2007 Guide - Protect your privacy, identity and secret information and eliminate sensitive data from your computer. It can erase Internet history, Web pages, pictures, unwanted cookies, chatroom conversations, confidential documents or files deleted in the past. HistorySweep Guide - Download HistorySweep to clean all history information left by web browser after your surfing the web. Tracks Eraser Guide - Protect you privacy by cleaning up all the unwanted history data on your computer. TracksCleaner Guide - Protect your privacy by cleaning Web history, cache, clipboard, cookie and more to Department of Defense standards! Password Saver (Business) Guide - A wonderful and secure password solution of storing business account and password for business operation! Password Saver (Personal) Guide - Rich feature solution to store your password, organize, add and edit password records in security and centralization! PC Spy Keylogger Guide - A top-rated, invisible and easy-to-use surveillance tool that records every keystroke to a log file. 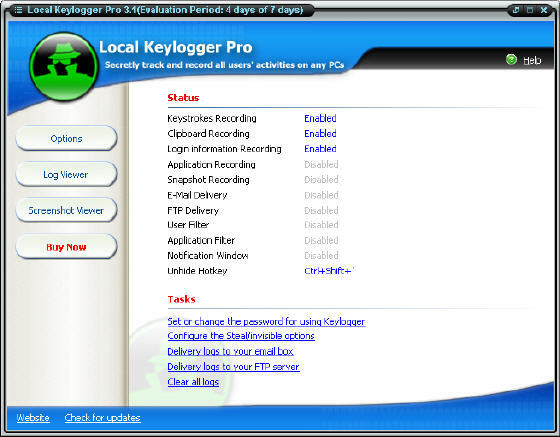 Local Keylogger Pro Guide - Monitor all users' activity on any computers in real time and record each computer's usage history. Multi-screen Remote Desktop(MSRD) Guide - fast, secure and affordable remote-control software that enables you to work on a remote computer in real time as if you were sitting in front of it. ICQ Password Recovery Guide - Just select the *.dat file of the ICQ user, and then the UIN, nickname and password will instantly be decrypted. Hotmail & MSN Password Recovery Guide -Recover the stored or saved password to the Hotmail and MSN Messenger account on your local computer. Outlook Spam Filter Guide - It is an add-in for Microsoft Outlook that fights against spam. It can catch new spam e-mails and clean any Outlook folder from spam. Privatefirewall Guide - Privatefirewall is a powerful personal firewall and intrusion detection application that eliminates unauthorized access to your PC. SafeZone Guide - SafeZone locks a computer system to external connections by analysis and routing of network traffic. 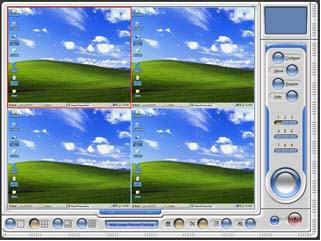 It can be customized to isolate, record and warn the user of all hacking attempts. SpamRemover Guide - All incoming e-mails will go through SpamRemover which filters, compares and learns from e-mails you get daily, so you'll get a clean mailbox in just a few days. SpamWasher Guide - It avoids junk emails reaching your inbox or eliminates them before they arrive. It knows your friends and blocks the spammers with the anti-spam program built-in. Antispy Guide - Antispy is used to clear the history of your computer. You can clean cookies, downloaded program files, index files, cache, location bar history and more. Spy Killer Guide - Spy Killer is a revolutionary spyware detection and removal application that offers protection around the clock for Home and Corporate users from spyware. Spy Remover Guide - Spy Remover is used to clean the history of your computer. You can clean cookies, downloaded program files, index files, cache and more. SpyCop Guide - SpyCop for Windows scours your system looking for surveillance spy software secretly installed on your PC without your knowledge or consent. PlanetRemote Guide - PlanetRemote is a unique software application that enables you to take control of your computer remotely and interact with its desktop as if you were sitting right in front of it! Remote Task Manager Guide - RTM even supports remote installations, enabling a systems administrator to set up a service on remote machines without ever having to physically go to them. McAfee VirusScan 2005 Guide - McAfee VirusScan 2005 is an easy-to-use antivirus solution that ensures your PC free from viruses, worms, Trojans, spyware, web dialers, and other malicious threats. eTrust PestPatrol Anti-Spyware Guide - It gives you the ability to sweep your PC of malicious software, and to invisibly track the sites you surf, the products you buy, and the messages you send. SureClean Professional Guide - SureClean Professional allows you to choose exactly what data you want to securely erase; when and how often you would like your files been cleaned. Evidence Sweeper Guide - Evidence Sweeper safely and completely increases system performance and completely clears away your unwanted history data and files. FlashClean Guide - FlasClean will automatically run in the background and clean up whatever tracks you want removed, whenever you want. Abacre File Encryptor Guide - With Abacre File Encryptor you may encrypt any files or folders by using 39 advanced encryption algorithms (CAST, Blowfish, Twofish, Rijndael and others). 1-abc.net Password Organizer Guide - It helps you with data that should be secure and is often known only by one person. You can manage all your passwords by entering just one personal password. EZ Password Secure Guide - EZ Password Secure is a powerful tool to help you manage all your passwords and usernames, as well as the URLs and descriptions, in different groups. Login King Password Manager Guide - The reliable password manager, Login King Password Manager automates your logins, saves your time, boosts security, and more. FAR Manager Password Recovery Guide - It is a program that instantly recovers and decrypts account information including passwords for all FTP sites that have been added in FAR Manager. FileZilla Password Recovery Guide - It is a program that instantly recovers and decrypts account information including passwords for all FTP sites that have been added in FileZilla. MSN Messenger Password Recovery Guide - It is the MSN password finder that instantly cracks and decrypts the MSN Messenger and Windows Messenger passwords stored on your computer. Total Commander Password Recovery Guide - It is a program that instantly recovers and decrypts account information including passwords for all FTP sites that have been added in Total Commander. Parental Control Suite Guide - The ExploreAnywhere Software Parental Control Suite contains a set of our most popular, award winning computer monitoring and restriction utilities and applications. Security Task Manager Guide - Security Task Manager provides advanced information about programs and processes running on the computer. It shows all active processes on your computer. Spylo PC Monitor Guide - It is the award-winning and highly flexible security monitoring software used by parents, business organizations, and for the tasks like testing of usability or studies of PC usage. Spytech NetVizor Guide - Spytech NetVizor is the latest in powerful network surveillance and network monitoring spy software. Monitor your entire network from one centralized location! 1 Click Spam Shield Guide - Receive all your email safely and securely, resulting in a clean Inbox with just solicited mail and no more junk email. 1 Click Spy Clean Guide - A powerful detection tool that detects and removes various kinds of spyware from your computer. 1 Click Encrypt Guide - Provide simple yet secure & safe way of protecting your confidential data by encrypting files and folder trees. CryptoExpert 2006 Professional Guide - The system mounts a volume file to create a "virtual drive" that appears to applications like any other physical drive. File Secret Guide - A Unique Collection of File Base utility for Hiding, Protecting, Locking and safely destroying a file. Web-PC-Exe Lock Guide - Allows to control access to PC, Internet sites, programs and system functions, and suitable for parents to control their children's online action. eMailTrackerPro 2006 Guide - Trace email messages and verify the sender of an email and their geographical location to stop spam email. MailSweep Guide - Browse your mailbox and view sender, subject, size, and header information before downloading it from the server. Max Anti Spyware Pro Guide - Maximum protection against the spywares and malwares with active monitoring for individuals, professionals and home. Mozilla Password Recovery Guide - Recover the passwords for Firefox, Mozilla and Thunderbird, decrypt passwords protected with User Master Password.